September | 2012 | Dorothy Day Catholic Worker Washington, D.C.
We were small in number but we made our presence known. Upon arriving at our designated vigil site across from the Gaylord National Resort and Convention Center, site for the Air Force Association hosting some 150 arms contractors at the annual “Arms Bazaar,” we discovered there were no police posted to keep watch over us as in years past. So our community of seven processed to the main entrance of the hotel where AFA members were entering to have their $330 per plate banquet. As some military and weapons contractors were entering, we read our leaflet (see below), sang and vigiled until Gaylord security and local police ordered us to leave or be arrested. Seeing that several of us have cases pending elsewhere and that we did not plan to risk arrest this time, we complied with police. We returned to our regular vigil site and conducted a prayer service to end the use of lethal drones. We also prayed for the elimination of all nuclear and conventional weapons on earth and space and for the abolition of war. We remembered all victims of warmaking, violence and oppression, our beloved peacemaker sister Anne Montgomery who went home to God on August 27, and Troy Davis who was executed last year at this time by the state of Georgia. We also remembered Amber and Kevin Mason (from the DDCW), Fr. Roy Bourgeois, Maia Rodriguez and Becca Polk on trial in D.C. Superior Court for the SOA Watch action last April; Fr. Carl Kabat who is in court today in Kansas City for his July 4 plowshares witness at the new Bomb plant being constructed in Kansas City; the Transform Now Plowshares, including Mike Walli who was present with us; and Susan Crane, in prison for for a probation violation related to her Disarm Now Plowshares action in 2009. Let us pray for each other and that the Holy Spirit will continue to guide all of our efforts as we strive to be God’s peacemakers and to help create the Beloved Community. 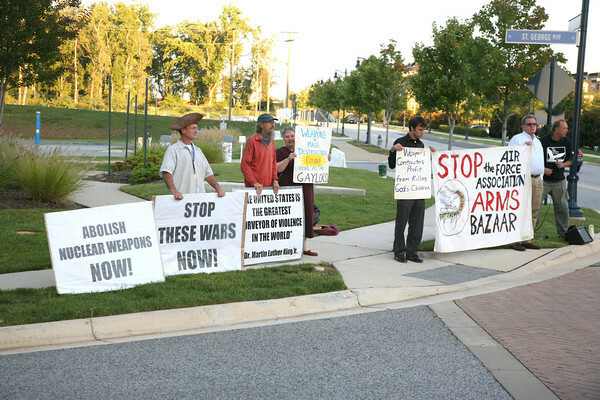 This is an invitation to please join with the Dorothy Day Catholic Worker and other peacemakers in a nonviolent witness to protest the AFA Arms Bazaar (see below). Please come and bring a friend. And please spread the word and post this wherever you can. Together, let us continue to do all we can to create Beloved Community and establish God’s reign of justice, peace and nonviolence. Where: Gaylord National Resort and Convention Center, 201 Waterfront St., National Harbor, MD 20745. We will meet for the vigil at the corner of Waterfront St. and St. George Blvd., directly across from the Gaylord National Resort. The Air Force and some 150 arms contractors taking part in the AFA Air & Space Conference and Technology Expo, what we call an “Arms Bazaar,” have played a prominent role in U.S. warmaking. These arms contractors are profiting from war and literally are making a killing! But that’s not all. The Air Force and numerous arms dealers are committed to U.S. nuclear/military superiority and militarizing and controlling space. The U.S. continues to be the #1 arms dealer in the world. Worldwide weapons sales by the United States tripled in 2011, according to a new report by the Congressional Research Service. U.S. arms sales to both developed and developing nations reached $66.3 billion last year, up from $21.4 billion in 2010. Russia, which had the second highest weapon sales, sold $4.8 billion worth of arms. Total worldwide weapon sales nearly doubled to $85.3 billion, making the U.S. responsible for more than three-quarters (77.7%) of all global sales. Some of the biggest purchasers of U.S. weapons were Middle Eastern nations, including Saudi Arabia, whose purchase of 84 advanced F-15 fighters in part accounted for a $30 billion bill. The U.S. also sold around $2 billion worth of antimissile batteries to Taiwan, a deal that caused tension during a diplomatic Chinese military visit last July. From September 17-19, the AFA will host speakers and seminars that will address how the U.S. can refine its warmaking and remain the preeminent military superpower on earth and in space. And on September 19, the AFA will hold a $330 per plate banquet sponsored by Lockheed Martin. On September 19, as the AFA holds its opulent banquet, The Dorothy Day Catholic Worker will sponsor a nonviolent vigil to decry this sinful Arms Bazaar. Who will give voice to the victims who have suffered and died in Iraq, Afghanistan, Pakistan and elsewhere as a direct result of U.S. warmaking, and weapons, like the Drone ”Predator” and “Reaper” war planes, produced by the arms contractors participating in the “Arms Bazaar? In the name of God who calls us to love and not to kill, it’s time to end this scandalous Arms Bazaar! It’s time to repent of U.S. war crimes and make reparations to all victims of U.S. warmaking. It’s time to bring all the war money home, alleviate poverty, meet urgent human needs, and save our environment. It’s time to eliminate all weapons, end all U.S. military intervention, abolish war and practice nonviolence. Please consider coming (and bring a friend) to this important vigil, and say Yes to Life and a resounding No to the war profiteers. We must not let this Arms Bazaar go unaddressed! Directions from Downtown D.C., Parking and Meeting Place Take 395 South (off of New York Ave. or Constitution Ave. at 9th St. NW) Merge onto 295 South via exit on left (crossing into Maryland) – 7.4 miles. Take the exit toward National Harbor. Take ramp to National Harbor Blvd. Bear left on National Harbor Blvd. and go two blocks to St. George Blvd. Make a right on St. George Blvd. Go to one block before Waterfront St. and look for street meter parking. Also St. George Parking Garage is on right in case you can’t find street parking (just past the cross street called Mariner Passage). The garage is one block before Waterfront St., where the Gaylord National Resort is located. We will meet for the vigil at the corner of Waterfront St. and St. George Blvd. on the sidewalk in front of the Gaylord National Resort. If you are coming from Maryland or Virginia use Map Quest for the most precise route to the Gaylord. Public Transportation If you would like to use public transportation, take the Green Line to Branch Ave. Get off at Branch Ave. and take the NH1 National Harbor bus line. This bus takes you to the corner of St. George Blvd. and Waterfront St. across from the Gaylord National Resort. Call 202-637-7000 and select “ride guide” for best directions. Or go WMATA web site.